In this podcast I will answer the question: What are the benefits of employing a child? And what are the limitations? Employing a child can be effective way to shelter income from taxes. The earnings a child receives can be put into a Roth IRA, IRA or company tax deferred plan (to minimize the kiddie tax). Payments to the child must be reasonable in relation to the services rendered. In addition, payments must made to the child – not held for the child. Employment of a child is also affected by child labor law regulations. Although there are strict laws that detail appropriate jobs and hours based on age, children working for a parent generally fall under an exception to these laws. Payments for services of a child under 18 working for his/her parents in a trade or business are not subject to FICA (Social Security and Medicare) taxes, if the trade or business is a sole proprietorship or a partnership in which each partner is a parent of the child. The above exemption also applies for federal unemployment tax (FUTA) purposes for children under 21. These exemptions do not apply to children performing services for a family corporation, estate or partnership, except for partnerships in which each partner is a parent of the child. Example 1 – Parent in 35% tax bracket pays son $5,000 during the year to maintain rental property. The deduction from the parent’s taxes is 35% of $5,000 ($1,750). If the son has no other income, he will pay no taxes because the standard deduction reduces his taxes to $0. Example 2 – Parent in 25% bracket hire daughter to help with business and pay her $15,500 during the year. The daughter puts $10k into the partnerships Simple IRA plan and her earned income is below the standard deduction. The parent’s save $3,875 on federal taxes. 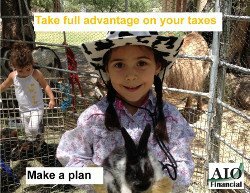 Kiddie Tax is a tax that is applied to a child’s unearned income of more than $2,000. Unearned income refers to investments, such as interest, dividends and capital gains, income from wages or self-employment are not included. The tax is meant to discourage parents from reducing their own taxes by shifting investments to their children, who generally have lower tax brackets. The Kiddie Tax once affected only children under age 14. That’s how it got its name. Full-time student age 19-23 at the end of 2014, with earned income (from working) that is less than or equal to half their support. The tax starts only when your child’s investment income exceeds $2,000. The first $1,000 reported on your return is tax free, the second $1,000 is taxed at the child’s rate. Unearned income above $2,000 is subject to the Kiddie Tax – meaning it is taxed at the parent’s tax rate. Marginal tax rate is your highest rate applied to the last dollar you earned. That could be as high as 28, 33, 35%, or 39.6%. Have your child file a separate tax return (using Form 8615). The tax on your child’s income will be the same either way. The first option is easier but could increase your taxable income and prevent you from taking certain deductions and credits, such as those for education. I appreciate any feedback about our AIO Financial blog, podcast, or videos. That’s a very naive point of view, Guest. There’s nothing about atatrcting and maintaining an engaged and excited workforce that . . .